Forest stroll to comfortable win against Morecambe.. | Through the seasons before us..
Forest stroll to comfortable win against Morecambe..
Hopefully plenty of pictures of Earnie in a Forest shirt like this will be forthcoming this season! That sounds promising, now doesn’t it? The early pressure all came from Forest, a Davies cross evading Earnshaw and Martin fractionally; the provider almost turned predator shortly after this, when he met a Luke Chambers cross but was unlucky enough to hit the post rather than scoring. A freekick was struck into the wall by Earnie, the rebound was hit by the Moussinator but deflected for a corner. Forest opened their account from a freekick, one which new boy Martin was rather harshly booked for taking too quickly. Once the booking was resolved, Cohen stepped up and duly despatched the ball expertly into the bottom corner of the net. One nil! Davies was withdrawn due to the predictable injury (argh! another attack minded player is injured!). He was replaced with Garath McCleary. Earnie should’ve made it two after great work from Martin, but his shot from 14 yards was wide of the goal. With around ten minutes until half time, Paul Smith was finally called into action – to, well, basically stand where he was – since that’s where the shot that Morecambe mustered was headed! Martin was starting to grab people’s attention with an energetic and penetrative performance, although a shot he created was deflected. Earnshaw had a few close calls due to an offside flag, including him actually putting the ball in the net as the first half came to a close. The lead was doubled upon the hour, Joe Heath playing a through ball to Earnshaw who was able to flick the ball past Barry Roche before executing his trademark celebration infront of the intrepid fans who attended. Newbold came on as a substitute, put one chance wide and then duly scored after calmly controlling Cohen’s cross and slotting the ball home from the middle of the penalty area. The finale came from Earnshaw, picking up a pass and making a direct run down the middle – ending up in a one-on-one situation with ‘Captain Chaos’ Barry Roche. The Welsh International made no mistake, stroking the ball past the ‘keeper and into the corner of the goal, sealing a scoreline that reflected the relative ease at which Forest were able to play their way through this fixture. Lee Martin was limping towards the end, here’s hoping it’s nothing more than a touch of cramp and he’s available for the Swansea game. 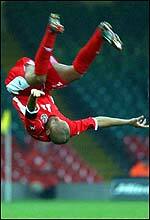 Addendum; I’ve found a picture of Earnie celebrating this very evening! Click here. Only Morecambe, I know, but it’s about time we were able to brush this calibre of team aside convincingly! Lee Martin had a great game, another fine addition. The word from the commentary team was that he pulled up due to cramp, I hope that’s all and that we see this win kick-start many more to come. I went at the last minute with my lad, great decision as I really enjoyed the game. Lee Martin looks like he might be the real deal, took every opportunity to get the ball and has pace to burn. Lee Martin was ill over the weekend as on the off. site. Makes it even more interesting doesn’t it…. A massive improvement on previous cup matches vs lower opp., a couple of kids got vital time on the field 2. Almost all +ves from the match with only the injury to Davies a blip and still no Cole on the field yet….